Original 1st Press Dutch LP released in 1990 on Columbia Records. Cat: 467201 1. Printed inner bag is in Excellent condition. This album has only been played twice!! Long before the phrase, "Seattle scene" spoke of an impact that a new generation of musicians was having on rock music, Alice in Chains was struggling to be recognized in the shadow of bands that were more focused on image than craft. 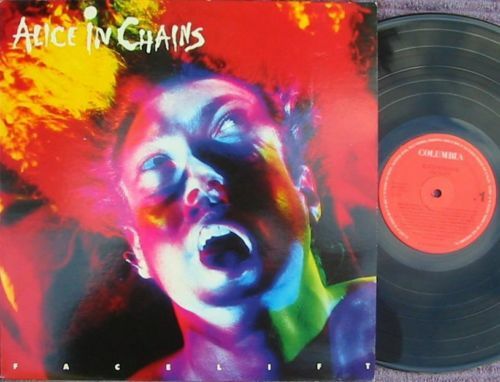 On FACELIFT, the band's major label debut, Alice in Chains proved that its fusion of blues, hard rock, and gritty imagery was a force to be reckoned with. While college radio stations ate up fare like "It Ain't Like That" and "We Die Young," the song "Man in a Box" became a banner track that pushed the band into the forefront of heavy rotation on MTV and the playlists of mainstream rock radio stations. Vocalist Layne Staley's moody, dynamic vocals on "Love, Hate, Love" tell a chilling tale of a homicidal psychotic lamenting and musing over what he's done to his lover. On tracks such as "Sea of Sorrow" and "I Can't Remember," guitarist Jerry Cantrell shows equally impressive skill in Sabbath-styled riffing, blues licks, and Hendrix-influenced solos. Alice in Chains made a brash musical and lyrical statement that gave the stale era of thrash and hair metal a much-needed facelift. Tracks: We die young/ Man in the box/ Sea of sorrow/ Bleed the freak/ I can’t remember/ Love, hate, love/ It ain’t like that/ Sunshine/ Put you down/ Confusion/ I knowsomething (bout you)/ Real thing. There are no signs of spindle marks on the labels Record is stunning, like new and in Near Mint condition. Gloss cover has very minor scuffing on corners and a tiny surface tear on top centre edge and is in Near Mint condition. If paying by direct deposit please put Ebay Item number as reference.